Air Fryer Cooking Times + Printable Cheat Sheets! These Air Fryer cooking times will help you make your favorite foods healthier! All of the Air Fryer cook times are included in the printable cheat sheets! Air fryers are fairly new to the appliance scene! They’re an awesome tool for frying chicken and other foods without oil! They use hot air and circulation to cook food to the crispy finish we love without submerging them in oils. Most air fryers can accomplish a “fried” texture using 80% less oil than you’d need for traditional frying methods. What is the pre heating protocol for cooking in the air fryer? Every air fryer or air fryer oven is going to be a little different. I’ll say that from trial and error it definitely helps to get things perfectly cooked if you preheat first! Like using traditional ovens if it’s already hot you can cook things more evenly and with less hot spots. Any air fry method is going to require that you turn things over about halfway through the cook time. Make sure you aren’t stacking things up too much in the basket or you will find the food cooked unevenly and possibly not at all. Remember, air fryers use circulated hot air to cook food. If the air can’t get to the food because it’s buried under other food it won’t cook properly. What kinds of foods can I cook in the air fryer? There are some obvious things that pop to mind, right? French fries, chicken wings, meat that benefits from some extra crispiness? Did you know you can cook almost anything in the air fryer?! 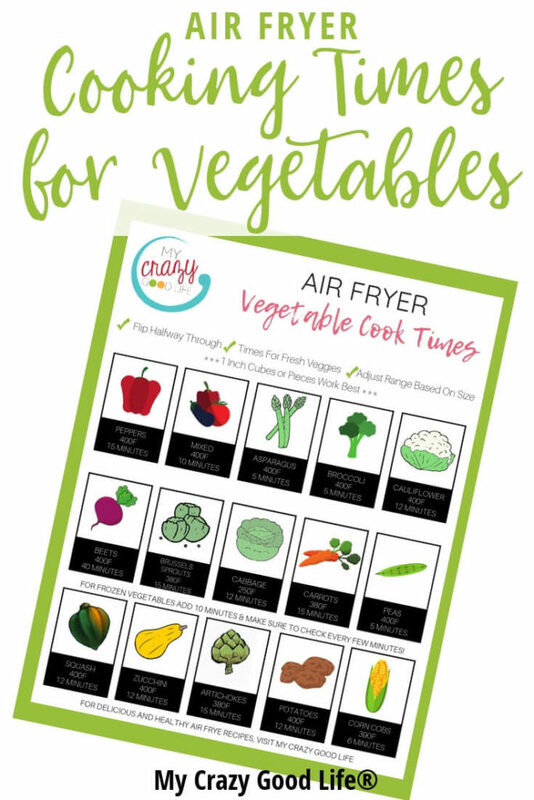 I’m sharing with you today air fryer cheat sheets for meat and vegetables. You can cook your favorite foods in the air fryer for a crispy finish and fast cooking times without any hassle. Do I have to flip food that I cook in the air fryer? Yes! I recommend you flip anything you are cooking in the air fryer about halfway through your total cooking time. Flipping halfway through means that you get a nice even crispiness and everything is thoroughly cooked. If you don’t want to actually flip things you can always just make sure to give the basket a good shaking to move the contents around and redistribute the heat. Some foods naturally contain fat that will cook out when heated to the super hot temps of the air fryer, others will need a light coating of oil if you want them to crisp up and get crunchy. A light coating of oil will let the air fryer super heat the outer layer and achieve the browning effect we look for when frying foods in oil. If you don’t want to brown or crisp foods you don’t have to add oil when cooking. How does the air fryer cook vegetables? In the case of vegetables you do not need to add oil, the air fryer will give you a sort of roasted effect, similar to baking in a traditional oven. If you want a roasted flavor in the end you can drizzle your veggies with oil but it’s not necessary for cooking. How do I prep meat and vegetables for the air fryer? You’ll want to make sure you have everything you wish to air fry chopped or diced into similarly sized pieces. If you have some large and some smaller pieces mixed together they won’t cook evenly. Larger pieces are going to take longer and you may potentially overcook the smaller pieces. Drizzle with oil if you wish, make sure to mix so that the oil is evenly distributed. Don’t overfill your air fryer. The fill level will impact your cooking times and also impact the overall final product. Air fryers use forced hot air to cook anything you put in there, if there’s no room for the air to circulate there’s no way for anything to get cooked properly. On these air fryer cooking times sheets you’ll find cooking times for all different kinds of vegetables and on the meat version you’ll have different kinds of meats. Each one includes cooking time and temperature! I love having these cheat sheets nearby when I’m cooking. They’re great for on the fridge or in a drawer in the kitchen. It’s an excellent way to make sure I can just look, set my temperatures and times, and get cooking! Looking for more printable cheat sheets? 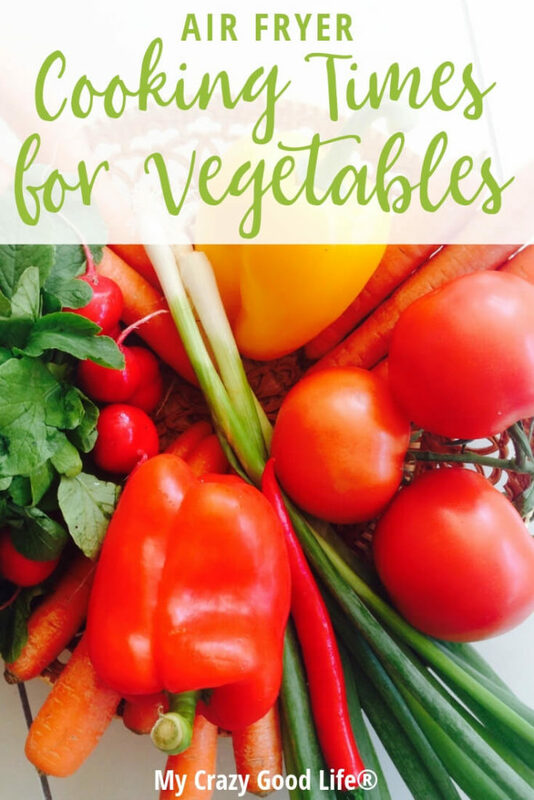 I have an excellent option for the Instant Pot veggie cook times as well as one for Instant Pot meat cooking times. 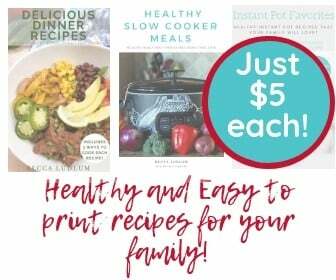 They are similar to these printables for the air fryer and have photos, cook times, and pressure release info all in one easy to reference sheet.